We have this super hipster donut place in the town that I live. The problem is, the donuts really aren’t that good. And that makes me so sad. I want to love your $4 donuts. But I just don’t. When we get a craving for perfect donuts, we head to a doughnut shop that hasn’t changed what they’re doing since the 1950s, including the prices, and they are perfection. (It’s called World’s Fair Doughnuts, if you’re ever in St. Louis). Anyway, a classic donut shop does the classics right, but lacks the flair of fun, new flavors. 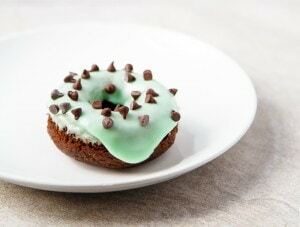 So I’m here with soft, fluffy chocolate baked donuts topped with a zippy mint frosting…that totally doubles as toothpaste. I’m kidding! Or am I? I have a baked donut pan that holds 6 donuts. When I bought it, I doubted I would use it that much, but as it turns out, I use it a lot. I’ve made Chocolate Chai Donuts, Crumb Donuts, Cranberry Cornmeal Donuts, and Pumpkin Donuts with Honey Glaze). If that doesn’t convince you that you need a donut pan, I’m not sure what will! Here’s the one I use, if you’re feeling the donut urge. Preheat oven to 375, and grease a donut pan with a capacity of 6. In a medium bowl, sift together the flour, cocoa, sugar, and baking soda. In a small bowl, whisk together the egg, vanilla, buttermilk and oil. Combine the wet and dry mixtures and stir just until no streaks of flour remain. Finally, stir in the mini chocolate chips. The batter will be thick. Spoon the batter into the donut molds, smoothing the surface. Bake for 8 minutes, or until they spring back when touched. Immediately after coming out of the oven, dump the pan onto a cooling rack, and let the donuts cool while making the frosting. To make the frosting, whisk together all ingredients (minus the chocolate chips) until smooth. Add additional buttermilk as needed to make a smooth consistency. 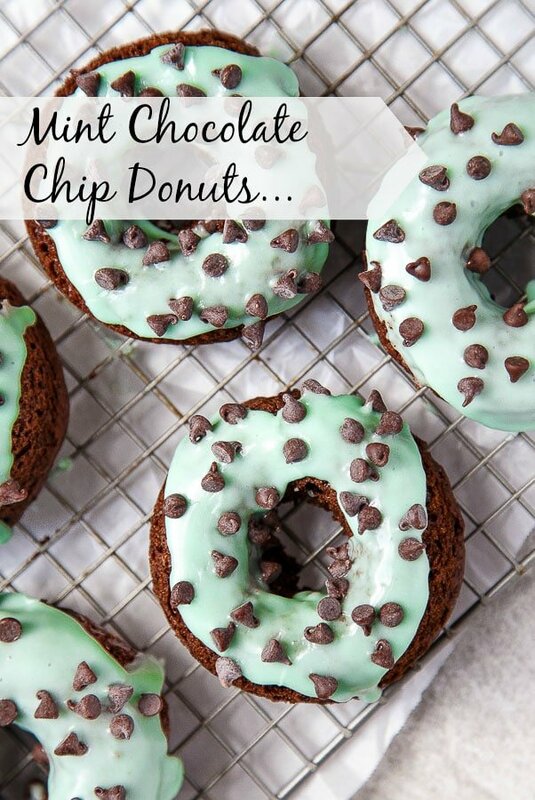 Spoon the frosting over the donuts and top with the mini chocolate chips. Well, I’ve had plenty of scoops of mint chocolate chip ice cream, we always buy Perry’s because it’s produced locally. So I’m in love with these donuts and want to dip them in the ice cream. And honestly, bathing suit season is almost over anyhow, so who cares? And just because I need a girdle to fit into my bridemaids dress next month….sigh. I’m eating these donuts. But why isn’t it doughnut? Mint chip is just the best! That last photo makes me want to reach into the screen and grab that donut! This is such a fun flavor combo!! 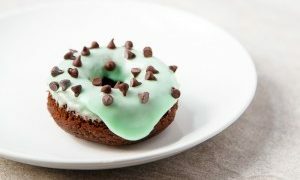 Mint chocolate chip is one of my favorite ice cream flavors… need it in donut form asap! Oooh these are so pretty!! I love mint chip, too. And a disappointing doughnut is the worst, especially when you pay $4 for it! I just LOVE these photos and the donuts look like perfection!!! Oh my goodness! I would love these!! Your Chocolate Chai recipe is SO delicious that I know this one is going to be a winner too! And mint in the summer heat…perfect! Thank-you, can’t wait to try them. Wonderful recipes, photography, and writing makes me look forward to every post and crave more! I’ve been to several ‘hip’ donut shops in our area and none of them have been any good. And the one place that did have good donuts, the owner retired and sold the place. So now I need to make my own. More donut recipes, please! World’s Fair Doughnuts is the bomb! The Libertine was taking their doughnuts, pulverizing them and then making them into ice cream. It was magical. Sadly, their chef left and I don’t know if they’re still serving up that confection. And I know exactly which $4 shop you’re talking about. I’ve been unimpressed so far… besides the gooey butter doughnut. But it’s hard to go wrong when you squeeze that much better and sugar into a single serving. These donuts are so cute! 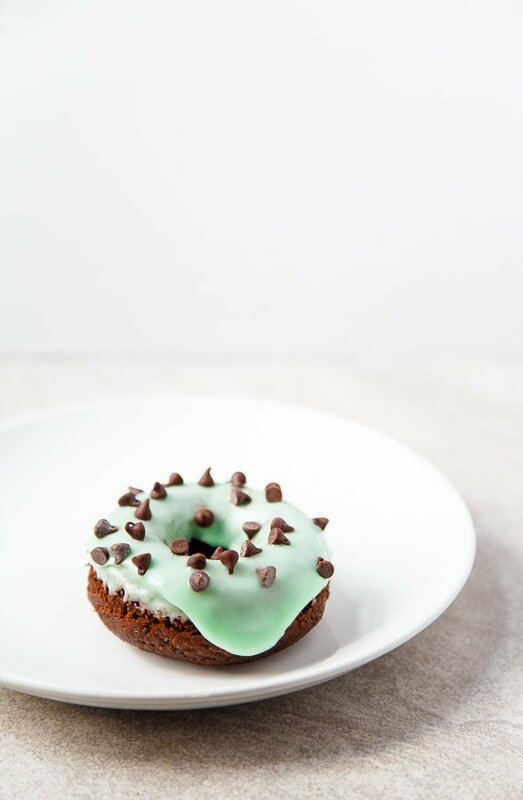 Mint and chocolate is such a great flavor combo. Thanks so much! I think the ‘hipster donut place’ does a good Gooey Butter Cake, but that’s about it. I’m glad I’m not the only one! I made these today. They were fantastic!! To lower the sugar content, I made 1/2 the amount of frosting and drizzled it over the donuts. They still tasted heavenly. Sorry, didn’t care for these. They tasted like cake baked in the shape of a donut, not a donut. These were really good! Mint Chocolate Chip is my favorite ice cream so making these was a no brainer. I love that it’s a recipe for 6 donuts…2 a piece for breakfast and 1 more a piece for dessert tonight. Rather than spooning the batter into each donut mold…I take a quart size freezer ziplock bag…prop it up in a measuring cup with the top folded back…pour the batter into the bag, zip it closed, and cut a half inch opening in one corner…then pipe the batter into each mold. Thanks, Christina for developing these small batch recipes. I’m definitely going to try your other donut recipes.